I had planned to have a recipe ready for today's Vegan Vednesday but getting stuff in the mail and trying new foods was such a success that I decided to go with that. Plus it was easier to open bags of delicious chips than to figure out a new recipe. I have to psyche myself up to try new recipes. I have always been a corn chip fan. I love salty crunchy foods. When these chips were sent to me I had no idea what to expect. I didn't know what kind of chips even. My friend Burt, who is friends with Amrit who works for Beanfields, suggested that I review the chips for my blog. Other than thinking that if Burt, a vegan, suggested it then they were probably a healthy type of food. I had no idea that they would be so delicious! They are made with beans and rice and are corn and gluten free. Also they are non GMO Verified as well as farmed and made in the US. I find the challenge of getting the two younger spawn to try new foods compelling. Getting them to try these chips was way too easy. No cajoling of any kind. I loved all the flavors and the Nacho flavor reminded me of staying up late eating Doritos in the early 90s watching MTV and drinking Mountain Dew. The old school Doritos before they went all crazy with the different flavors. Its a new era for me I suppose with vegan Nacho chips and hot tea instead! Beanfields offers 5 different flavors which are Naturally Unsalted, Sea Salt, Sea Salt and Pepper, Pico De Gallo, and (vegan) Nacho. The fiber fills you up so you feel satisfied and only 140 calories per 1 ounce serving! The boys ate the Naturally Unsalted as fervently as any of the saltier varieties. I also like that my snack has nutrition. Beanfield chips have 4 grams of fiber and 4 grams of complete protein per 1 ounce serving. 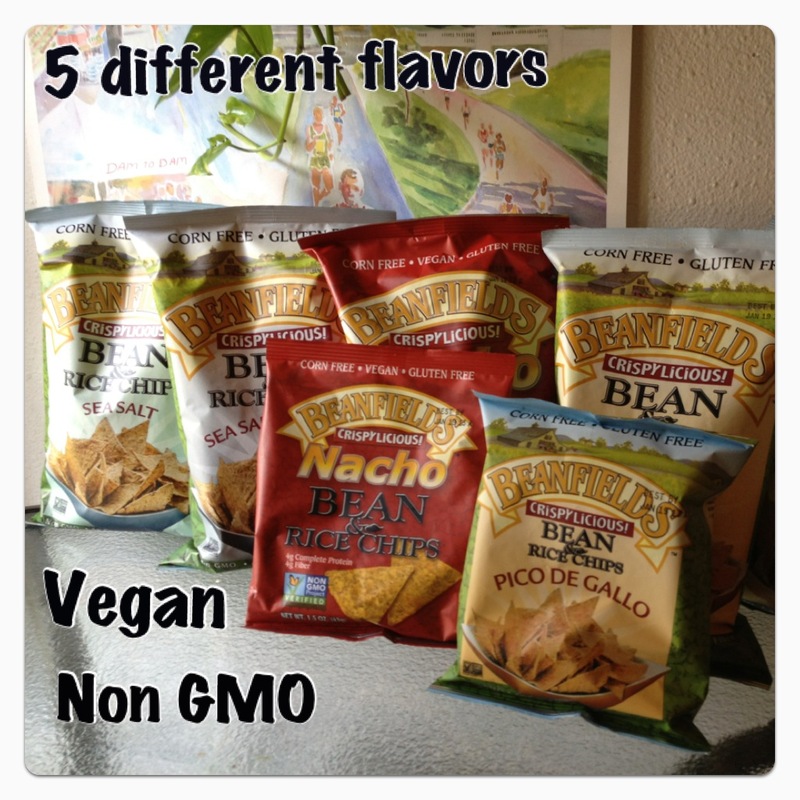 Check their store locator to find where you can get Beanfields chips near you. Find Beanfields on Facebook here and find Beanfields on Twitter here. What else did I eat today? For breakfast I had a bowl of curried sweet potatoes. I also had a spoonful of sunbutter. I love sunbutter and could eat the whole jar but I restrained myself. Trying to drop 5 or so pounds before winter gets here. 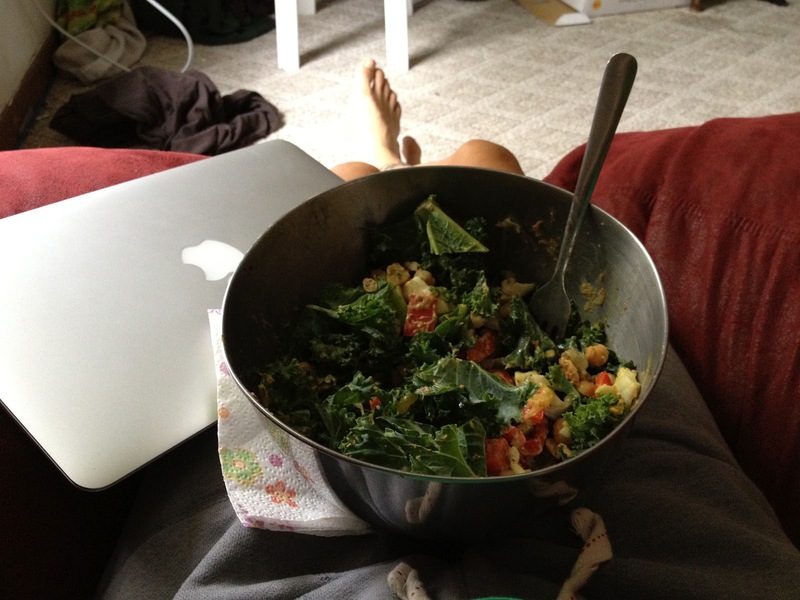 For lunch and dinner I made two massive salads. One I ate for lunch and the other I will eat for dinner. I put two cups (or more, I didn't measure) of kale, some chopped cabbage, at least a half cup but probably 3/4 cup of red peppers that were cooked with onions and some squash. Jaymon cooked that up for me and put it into jars in the fridge so I can just add it to my salads. It lasts much longer that way. I added a half cup of roasted chick peas to each salad. Nutritional Yeast and honey mustard dressing to finish it up. I like salads very much but do try and get some warm meals in the day too. One of my highlights of the day was making Kombucha this afternoon. I wish I would have had some ginger to squeeze fresh juice into the Kombucha I drank with lunch. 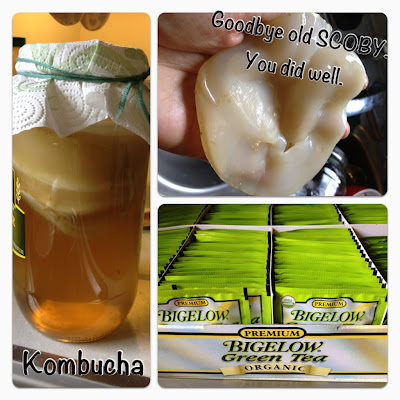 Anyone else make kombucha? Do you do Meatless Monday or Vegan Vednesday? I would love to know about your food choices too! I am always open to inspiration. I work on it and am probably 4 days a week. I try vegan all the time, but am realistic about it when we go to restaurants. I try to do Meatless Monday posts on my wine blog and have started really looking into vegan cookbooks as well. They have come a long way! I would love to start eating better. Most of my meals tend to be meatless to begin with (mainly becuase meat is too much to deal with in my case)but a vegan vednesday sounds like a fun idea!